Research recommends a phased approach, instead of a prescriptive one, for career decision making. This enables an individual to methodically narrow down and reach the final choice with self-discovery and learning. While O*NET is a comprehensive tool for this process, it is also fairly complex for individual decision makers and sometimes, even for counselors who want to use it. 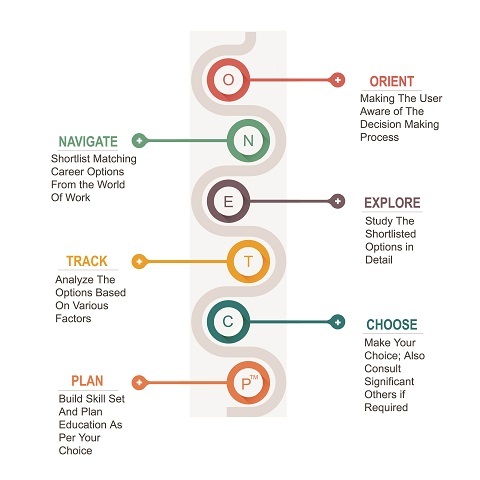 Phased approach: The different phases (Orient, Navigate, Explore, Track, Choose & Plan) make it easier for an individual to explore the world of work and discover his/her best fitment systematically. Communication between counselor and individual: The different phases also establish a working alliance between the counselor and counselee, an essential factor in career guidance.